Your message was sent successfully. Please check email for Collapsible Carousel In Email. A Collapsible Carousel is a unification of Carousel and Accordion. Information is vertically stacked up in a carousel, and the accordion helps to stack it horizontally. So you can add more content and still maintain the length of your email. Ecommerce websites can showcase more categories, products (with specifications). Banks can promote various investment plans by dividing them into categories, plans and details of the plan. Automobile companies can display their car models by dividing them into categories in the carousel, models in the accordion and features of the model inside the accordion. Tour & Travel companies can share their newly launched travel packages. Try putting destinations in the carousel tabs, various offers associated with that destination as the accordion list titles and details of the offer inside the accordion. Apple mail, AOL, all native apps, iPad. For email clients who do not support the element, you need to provide a fallback in the form of alt text and alt tags. 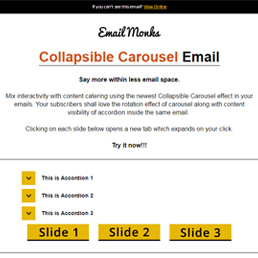 If you want the Monks to build your Email Template containing a Collapsible Carousel.